T2 and A17 can not serve Malakof due to accident. Service 25 - 1435 St.Stephen - St.Austell. Unfortunately this bus has been involved in an incident. Everyone is OK thankfully. A replacement bus will start the journey from Trinity Street at 1451 heading towards Fowey. We apologise that there is currently an incident on the service 42B and this may also delay the 1656 42A departure from Tamerton Foliot. 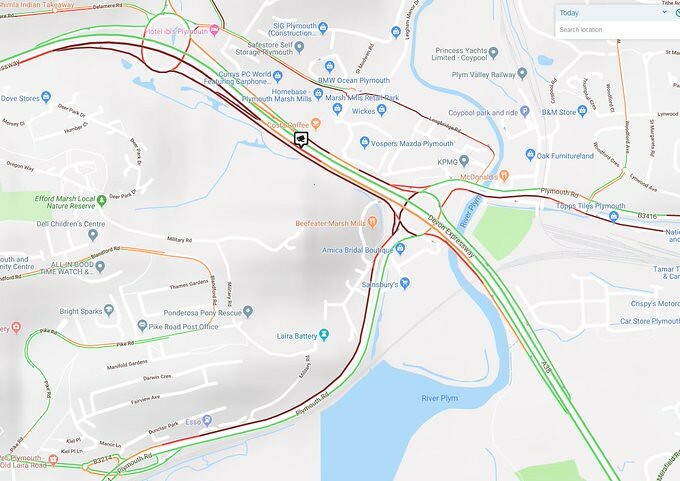 Due to an accident on the A38 Parkway, there is severe congestion at Marsh Mills which is causing disruption to services 20, 20A, 21, 21A & 51. Due to an accident blocking the road outside The Clowance Estate, 38 services cannot serve between Praze en Beeble and Nancegollan but are having to divert via Leedstown at the moment. Taxi protest currently going on in Royal Parade which will inevitably delay all our services trying to depart from Royal Parade. Sorry for this inconvenience which is beyond our control. Truro Tregolls Road - Apologies but there will be delays to services 27, 50 and 93 owing to unexpected Road Works. This is currently delaying services by up to 20 minutes. Exeter due to roadworks at Burnt oak Sidbury the 9 service will be turning around at Sidford. Service 24 - Tywardreath - apologies but both buses to and from Fowey are running 15-20 mins late due to unscheduled works in Tehidy Road and poor parking near the School. Traffic through the village is at a standstill. The Cawsand road closure ends Wednesday 6th February. From Thursday 7th February, service 69 will no longer operate. Services 70/70A/70B will be re-instated to the full route. Roadworks at Charles Cross roundabout start today. There may be disruption to our services. We are monitoring the situation to keep you updated. Remember you can see real time departures by downloading our app, to put you more in control of your journey throughout these roadworks. Service 43 will be on diversion from 0930-1530 from Tues to Thurs due to resurfacing works, buses will service Ernesettle loop to Northolt Ave turn around and exit via the same route meaning they WILL NOT service Uxbridge drive and Bull and Bush stops. #Exeter - Due to an emergency road closure on Exeter Road, Exmouth all Exmouth services will not be serving the Parade or Exeter Road for the rest of the evening. They will be going via Marine Way in both directions, serving the Savoy Cinema. All services from Truro, through Victoria Square, are unable to pick up passengers at Victoria square, this is due to road works, please use either Truro bus station or Ferris town as pick up points, we will keep you informed when Victoria square is back in use. Barnstaple due to a breakdown the 75A from Londonderry farm to Okehampton will be operating late, sorry for any inconvenience. 1325 21 Ilfracombe - Barnstaple will not operate due to a Breakdown. The falcon service departing Bristol airport towards Bristol at 03:57 has mechanical issues and is currently not continuing it's service. This will affect the 05:30 departure from Bristol to Plymouth. #Barnstaple 0651 21 service from westward ho will be operating late due to a breakdown. #Exeter due to a break down the 09:23 56 from Exmouth to Paris Street will be running approx. 30 mins late. #Exeter 09:55 '55B' Service Tiverton to Exeter will not be running due to a breakdown. #Gold service will be diverted Mon - Thu 8pm-6am & Fri-Sun 8pm-6am due to A38 road works until 22/2/19 Buses will serve Pool Park in South Brent, then divert via Marley Head and Westover before serving Ivybridge Town Centre. We will be unable to serve Bittaford & North Filham. Service 223 - Bodmin - Truro College. Apologies but this service is running 45 mins late at the minute. There has been a problem with the bus but it is now moving. #Exeter due to a break down the 0600 from Teignmouth to Exeter will not be running. #Exeter due to a break down the 0654 F1 from Savoy hill to Exwick will not be running. due to a break down the 0731 E service from Exwick to Lancelot Road will not be running. due to a break down the 0812 E service from Lancelot road to Exwick will not be running. due to a break down the 08:50 F2 service from Exwick to the High Street will not be running. due to a break down the 0916 F1 service from the High street to Exwick will not be running. Exeter due to a break down the 10:34 56B from Exmouth to Byron way and back again will nor be running. The 1245 service 155 from Tiverton to Barnstaple will not run due to breakdown apologies. Service 1 to Tavistock due at Yelverton 1720 has broken down. Meaning the 1740 from Tavistock will not be running. 1800 Coypool is currently not running due to break down but the only are all running. The 06:15 M6 service from Plymouth to London has suffered a technical fault and is currently expected to be delayed by 30 minutes. A replacement coach is on route. Service 27, the 0740 St Austell to Truro is currently running 35 minutes late due to an earlier technical fault which resulted in the bus being replaced at short notice. Service 12 has had a breakdown inbound towards Callington, bus will be up and running soon sorry for the delay. Service 12 departing Royal Parade at 23:05 will depart on time with a replacement vehicle and driver. thank you for your patience. The 09:00 Plymouth to Bristol will be operating late from Plymouth, It is currently 20 Min late. #Barnstaple 10:34 21 service to Bideford and the return journey at 11.30 will not operate, sorry for the inconvenience. 12:43 service 15A to Appledore will not operate Sorry for the inconvenience. The 07:30 M6 service from Plymouth to London is running approx. 25 minutes late, due to congestion on the A38 - Northbound. Stops affected: Exeter: 09:00 Bristol: 11:30 Bristol UWE: 11:45 London: 14:15. The 07:17 Taunton to Bristol falcon service is currently not operating. sorry for any inconvenience caused. The 08:15 Bristol Airport to Bristol Cabot Circus is current not operating. 11:30 Churchill to Bristol is currently not operating. Sorry for any inconvenience caused. The 13:05 Bristol Airport to Plymouth is currently not operating. sorry for any inconvenience caused. Currently the 1745 falcon will not be leaving Bristol Centre due to mechanical issues. We understand that this is the coach many people are awaiting. The 06:40 Plymouth to Bristol Falcon service is currently running 20 min late. The Falcon service due to depart Bristol at 23:30 is currently delayed for operational reasons. We will get it running again as soon as possible. The falcon service due to depart Bristol at 23:30 is now up and running, currently about an hour behind schedule. Service 214 - Par to Truro College. Please can all students get the Double Decker from Fowey as the Single Decker has been dispatched to cover another Truro College run today. Unfortunately the 07:34 Honiton Park and Ride to Plymouth Falcon is currently not operating. The 10:00 Falcon service from Plymouth to Bristol is currently operating about 35 Min late from Plymouth. The 1900 Falcon from Plymouth to Bristol will be running about 45 minutes late due to earlier break downs. The 1930 from Bristol Airport is Running an Hour Late due to Break down. Sorry for this inconvenience. Services in St.Austell will be severely restricted this morning due to a Heavy Snow shower settling on all roads from St.Austell to as far as Grampound Road. Apologies but as yet we cannot get buses out of our Eden Depot. We are currently unable to serve Whitemoor on the 21 and certain 22 routes, due to fresh snow and slippery conditions. Buses will go direct from St Dennis to Nanpean and vice versa. ST AUSTELL - Update 0730. We are currently assessing routes 24 and 25. Wet snow is currently falling and making certain roads difficult. The A390 at Holmbush now has sleet sticking. Service 101 - St.Austell Station - Eden Project. The 0846 service is running but will be late. The 101 will be on diversion around Trethurgy due to the road conditions and will head to the Eden service gate only. Luxulyan will be assessed later in the day. Service 30 - St.Austell Town Service. The bus is now operational but is testing the route around some of the estates. If these roads are poor then we will be using main roads only until the Icy conditions improve. 14:48 Service 101 update. We are now able to go through Trethurgy in both directions so it will resume its normal route. **369 Morchard Bishop to Exeter**We have just been advised that there is a tree down in the New Buildings area, the driver is aware, it might make the service a few minutes late, please bear this in mind. Tamar Bridge now closed to high sided vehicles, we are currently swapping our buses over to single deck vehicles for the service 12 and 72's. Due to high winds we are unable to service along the cliff Road through Freathy to Cawsand, our Rame services are being diverted via Hounster hill in both directions. 5 years ago, a significant stretch of Devon’s railway collapsed into the sea after storms destroyed about 100m of sea wall.